Hey there! Yahooie...I'm early this month!! We have some exciting things to plant in May in our areas...let's get growing!! We have soooo many things to be planted this month...do we have room for them?? Some can be planted in containers, some tucked in with the flowers...get creative! Get gardening!! I can't believe it is already May! I'm bumping this planting guide that PNG_Grandma so nicely formatted. @PNG_Grandma wrote: Hey there! Yahooie...I'm early this month!! We have some exciting things to plant in May in our areas...let's get growing!! At this time of the year, it's not a matter of what CAN be planted but what CAN'T be planted. The Valley has been hit with 90*F temps. Expected to drop into the 80s, even the 70s on Thursday and Friday with a 20-40% chance of rain. Time to get out the sun shade and sheers. Yay to the lower temps and rain!!! My new boxes really dried out today and everything was wilted. I had to water my hillsides today and tomorrow. Things just never got really wet this year so it dries out quickly. 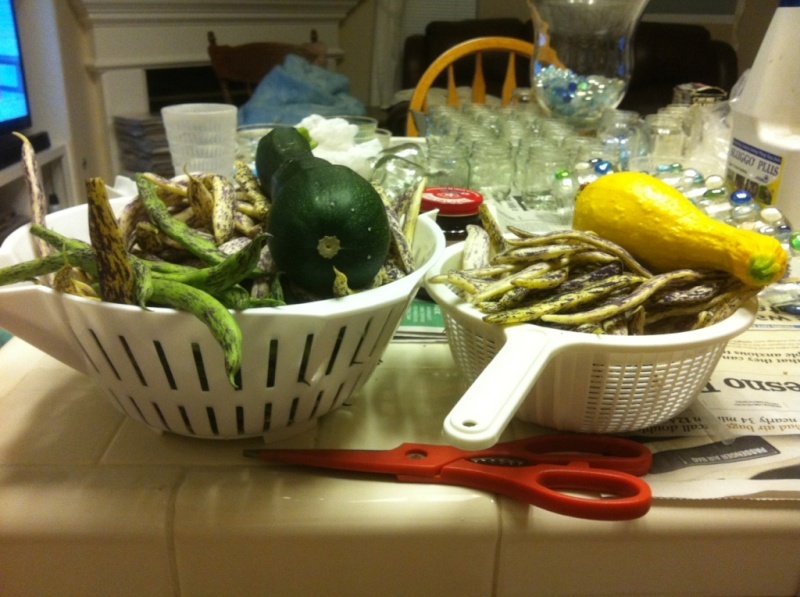 May harvest yesterday and today. More Rattlesnake and Dragon Tongue plus 1 zucchini and 1 straight neck. 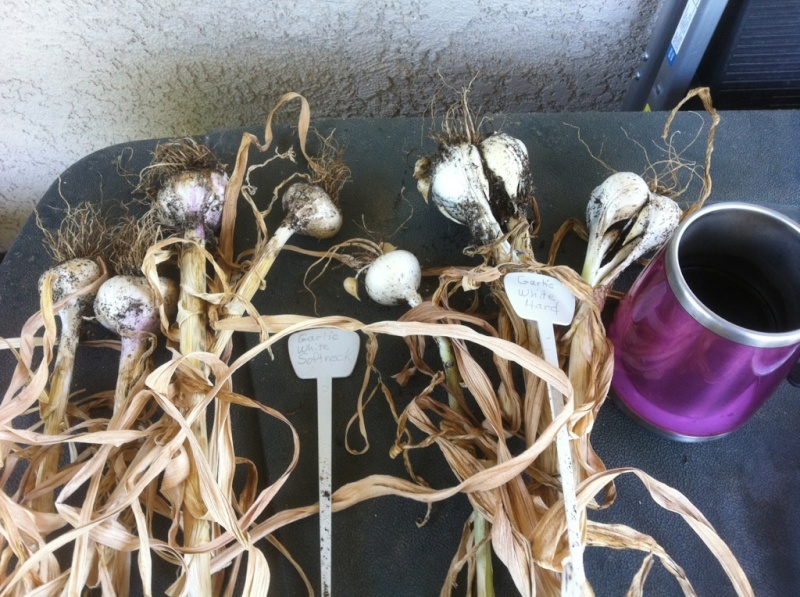 Garlic planted in December. From gifted large garlic. Russet sections planted this spring. 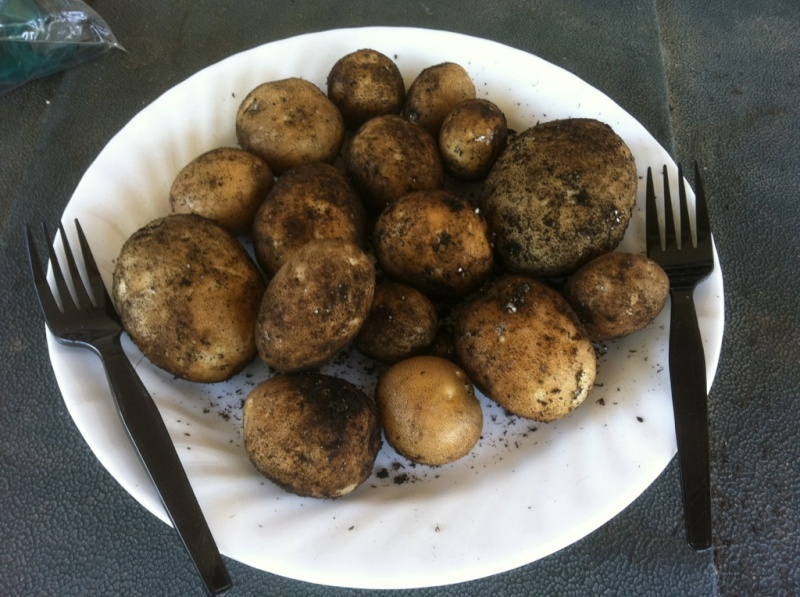 The tops died so I dug down and found these, plus small ones that went right back in the makeshift cage. The 2 black plastic forks have been planted in the newly planted front flower bed. The neighbor's cat loves the mix. Look at all that yummy goodness! I am starting to harvest tomatoes - my first full sized one will be ready in a day or so and a healthy handful of cherry and plum tomatoes. These have grown all winter in our greenhouse and are now loaded with fruit. I have really missed vine ripened since March!!! Bump. I looked at last year's Bump. Hot temps followed by cooling, chance rain. Same this year! @sanderson wrote: Bump. I looked at last year's Bump. Hot temps followed by cooling, chance rain. Same this year! The rain we were supposed to get tonight and tomorrow has disappeared, and the day after isn't much better. We'll be lucky to get a drop when we were supposed to get 3 days of it. WAAAA! Friday 90% here. I have bags of soggy, moldy leaves spread out drying (and somewhere someone has washed their car) so it's guaranteed it will rain Wed!! Half of the fall leaves were dry and I got them shredded and in a covered elevated bin. @sanderson wrote: Friday 90% here. I have bags of soggy, moldy leaves spread out drying (and somewhere someone has washed their car) so it's guaranteed it will rain Wed!! Half of the fall leaves were dry and I got them shredded and in a covered elevated bin. Didn't someone say you know a rain dance? Do you have to be nekkid in the moonlight for it to work? Armenian cukes and vine peach poked their prettly little heads up, today. Never tried either of them before. I can't wait to see how they turn out. Moonlight, yes. Clothes, optional. Helps if you have bedroom slippers and a headlamp. @sanderson wrote: Moonlight, yes. Clothes, optional. Helps if you have bedroom slippers and a headlamp. Ah, that explains it. Me, nekkid, probably scared the rain into the next county. I can borrow Hubby's slippers. Have to shop for the headlamp. WOW! IT WORKED! You are amazing, Sand. Nice, gentle rain falling on all my babies! It must have been the headlamp that did it. I guess I'll be playing in the house, today, but that's okay. Sanderson, I love the idea of bumping this thread. Seems to me we could do that in New England if we don't put a year on the threads. That would be fun... to go back and look at what we did the year before in the same thread we are currently posting in. CHIVES! Remember Charlie Brown and the football? Every year I buy a new pack of chives seeds, plant them carefully, and wait. Every year, nothing happens. Every year I go to Lowes, Home Depot, Walmart, & Shopko and try to buy a chives plant. Every year they have none. Today I had to go with son-in-law to drop off his car at the shop. RIGHT NEXT DOOR WAS MY FAVORITE NURSERY. I had forgotten all about them, but who could pass up a sign like that? 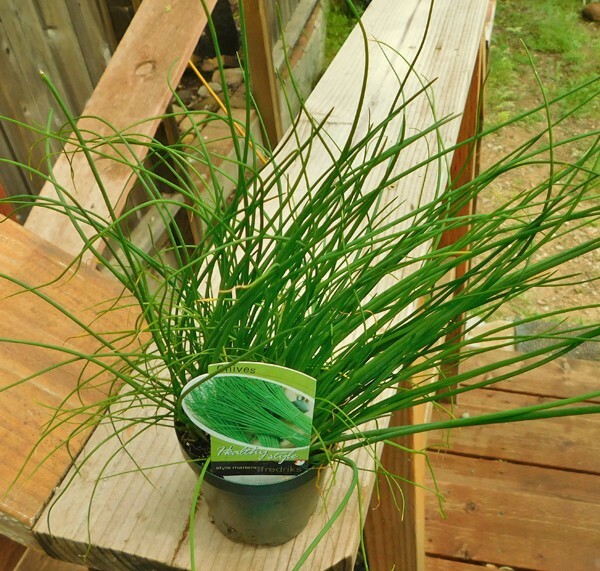 I am now the proud owner of a $2.99 4" pot of CHIVES! I should never be chivesless again. @countrynaturals wrote: CHIVES! Remember Charlie Brown and the football? Every year I buy a new pack of chives seeds, plant them carefully, and wait. Every year, nothing happens. Ah, ha, ha, ha, growin' a chive, grownin' a chive. YES! That can be our theme song. I have one that will be ready to harvest tomorrow or the next day! LOVE me some zuccs! @audrey.jeanne.roberts wrote: I have one that will be ready to harvest tomorrow or the next day! LOVE me some zuccs! I have a Sunbeam steamer, with a recipe for banana bread. I use that recipe, add some extra cinnamon, nutmeg, & ginger, and substitute shredded zucchini for the banana. I cook it out on the washing machine (outside laundry) so it doesn't heat up the house. We have homemade zucchini bread all summer. I am bumping this thread. Check out what we were doing in May the years before! Now that we're on the "Eat to Live" diet, we'll be needing homemade soups all summer, so we're going to buy some kind of electric pot and turn our outdoor laundry room into a "summer kitchen."